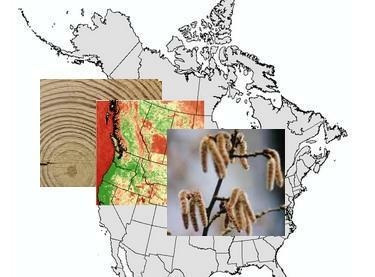 This project combines dendrochronological analysis with genetic field trials to determine which genotypes are particularly well adapted to handle extremes of Canada's changing climate. 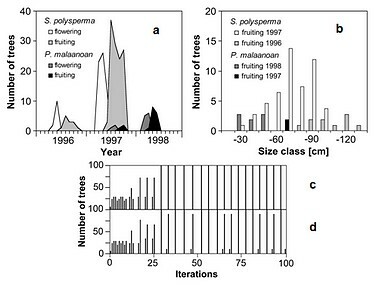 Jaime Sebastian Azcona and Zihaohan Sang pursue dendroecological research in white spruce provenance and progeny trials, and Miriam Issac-Renton and David Montwé conduct whole-tree stem analysis in provenance trials destroyed by mountain pine beetle to (1) reconstruct annual heigt and volume growth, (2) retrospectively measure carbon sequestration and water use efficiency, and (3) analzye within-tree ring growth signatures in reponse to climate extremes. Funding: $310K, 2012-2015; $310K, 2016-2019. This project synthesizes results from provenance testing, genetic progeny trials, genomics data, and climate change modeling to select the best adapted populations and genotypes for reforestation programs. Katharina Liepe analyzed spatial patterns of phenotypic and genomic variation and identified adaptively unique populations that may be threatened by climate change. 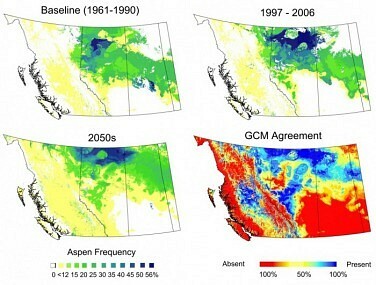 Laura Gray evaluated the adaptive portfolio of Alberta breeding populations and developed practical recommendations for reforestation under uncertain future climates. Zihaohan Sang will synthesize quantitative genetic and genomics data for seed transfer prescriptions that address cliamte change. Funding: $500K, 2011-2014; $200K, 2015-2016; $140K, 2016-2019. 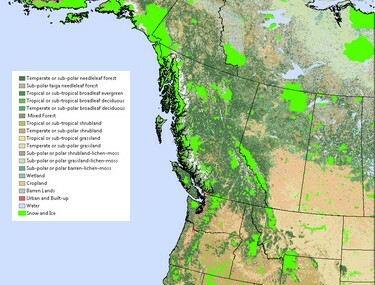 This project evaluates the conservation status of forest genetic resources in western North America through gap analysis. Erin Russell and Laura Gray conduct a detailed conservation inventory of current forest genetic resources for 50 forest tree species. Using the velocity of climate change approach, Quinn Barber and Dave Roberts identified vulnerable species and populations, but also climate refugia where habitat for locally adapted populations is maintained under a wide range of climate change scenarios. 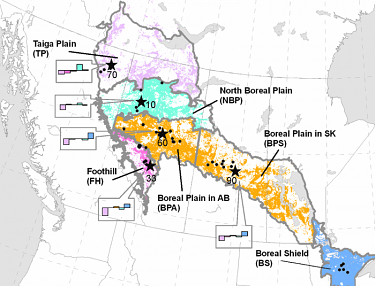 Jill Sekeli analyzes where to best place new protected areas to fill conservation gaps. Funding: $90K, 2009-2012; $100K, 2013-2018. The central idea of this NSERC/Discovery research project is to use introductions of North American tree species to Europe, Australia and New Zealand as a test-bed for how these species may grow and survive under novel climatic environments. 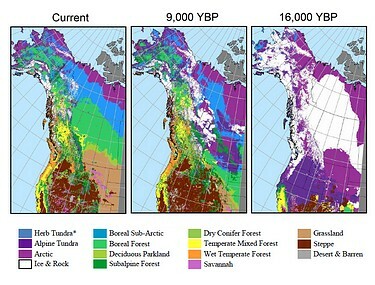 Miriam Isaak-Renton, Maria Herva and Jennifer Li compare model-based habitat and growth projections for Douglas-fir, lodgepole pine, and jack pine against decades worth of growth data from European test plantations to evaluate the realism of our growth and habitat projections under climate change. In a collaboration with CSIRO, we investigate adaptive genetic variation in radiata pine. 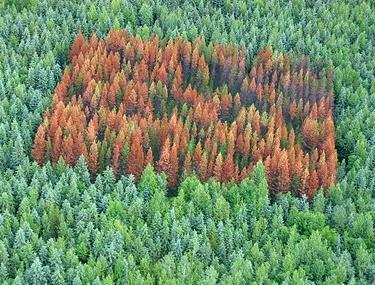 Adjusting seed zones and breeding programs to match planting stock to new climate realities is essential to maintain forest health and productivity. Laura Gray, Michael Mbogga, and Xianli Wang used climate modeling techniques and qunatitative genetic data to (1) predict future species habitat, (2) match genotypes with optimal planting environments, and (3) develop practical recommendations for reforestation under uncertain future climates. Dipterocarps, well known trees of the Southeast Asian rain forests, exhibit an unusual phenology. Mast fruiting events occur in irregular intervals of 2 to 10 years. This makes forest management and regeneration of this species group very difficult. Mariya Chechina tested whether a resource tracking model can explain and predict these phenological patterns. In addition the project aimed at understanding other ecological and silvicultural characteristics of this species group to support sustainable forest management. This NSERC/CRD project supports industry partners in genetic resource management of Alberta’s hardwood resource. The research focused on trembling aspen and balsam poplar, which are utilized in pulp and OSB mills. Tim Gylander, Stefan Schreiber, and Chen Ding covered three main tasks: (1) selection and breeding for economic gains, (2) ensuring that reforestation stock is well adapted to planting environments, and (3) maintaining adequate genetic diversity in breeding and production populations. Changes in global climate due to natural mechanisms have occurred throughout earth’s history and offer an oportunity to validate models that predict biological response to future climate change. 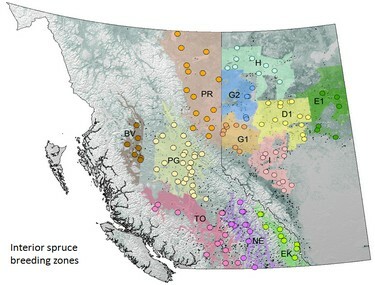 Under this NSERC Discovery grant, David Roberts (1) assessed the value of bioclimate envelope models projections, and (2) analysed how the historical biogeography of western North American tree species has shaped their genetic diversity and genetic structure. This Alberta Ingenuity New Faculty Startup Grant was used to pursue a variety of historical biology research approaches. 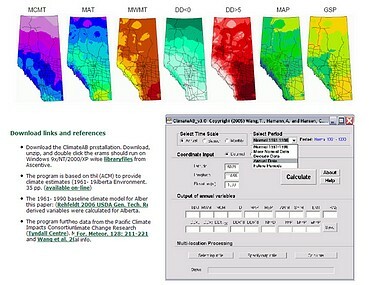 Elisabeth Beaubien, Pei-yu Chen, Haitao Li, and Cedar Welsh quantified the impact of climate variability and climate change on biological long-term records, including: (1) a 70-year spring flowering database for central Alberta from hundreds of observers, (2) an 80-year tree ring dataset for hundreds of trees, and (3) a 20-year large-scale remote sensing database.